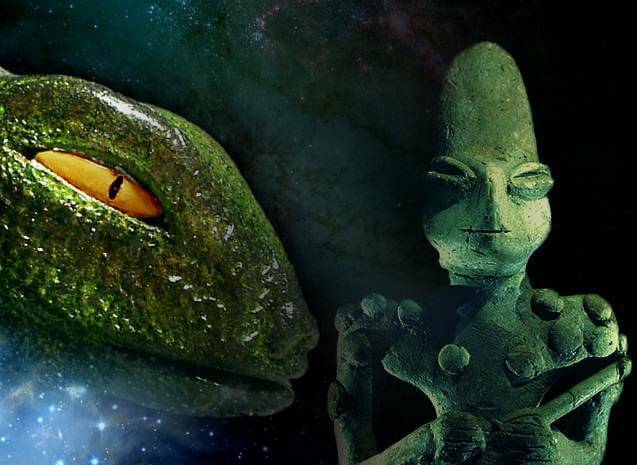 Home » What was the true aspect of the Anunnaki gods? number of people, including Swiss writer Erich von Daniken and Zecharia Sitchin, have created the “ancient astronaut theory,” which dictates that alien visitors have been influencing human life for thousands if not millions of years, even to the point of genetic manipulation. von Daniken, it should be recalled, was one of the first moderns to put forth the ancient astronaut theory and was widely ridiculed and vilified for his observations. Because of Sitchin’s apparent scholastic training, he becomes more credible for many, even though he is one of those renegades not scholastically trained in his field. Furthermore, it should be noted that neither man came up with the ancient astronaut theory, which was largely developed by a German occultic society, for one, during the 19th century. Perhaps mythology is simply not as exciting as the UFOlogical paradigm, whereby ancient astronauts were buzzing all over the place, being worshipped for their extraordinary capacities. However, the desire to see such a “history” often seems to be coming from exposure as a youth to comic books and sci-fi movies—and even the History Channel these days, featuring “Ancient Aliens” shows! developed. Like so many before him, Sitchin also wants to make the main character of the celestial mythos, the sun, into a person. Actually, he wants to make it into several extraterrestrials. These various gods found around the globe, such as Apollo, Osiris, Horus, Krishna, Hercules, Jesus and Quetzalcoatl, are not people or aliens but personifications of the solar hero, as was stated by the peoples who created them. The ancients were not so dumb that they mistook planets for people, even though they personified those planets and, where the knowledge or gnosis of the mythos was lost, they hoped for “the incarnation,” or the carnalization or appearance of a “god.” There is no need to recreate the wheel here by speculating upon what the ancients “really” meant. Goddess, alternately Venus, the moon, the constellation of Virgo, the earth, etc. Ishtar was “Astarte” in Phoenicia, and, as Frazer says in The Worship of Nature, “Her Phoenician worshippers identified her with the Moon…” Like the Greek god of the underworld, Hades, who allowed his beloved Persephone to return to the surface in order to create spring, Inanna was the creator of seasons, as she is depicted permitting the solar-fertility god Dumuzi/Tammuz to remain in the underworld for only six months out of the year. In fact, the same word in Hebrew is used for both jealous and zealous, although it is transliterated differently, “qanna” being jealous and “qana,” zealous. As El Elyon was but one of the Canaanite Elohim, the Most High God, so was “Yahweh,” as “El Qanna,” the Jealous/Zealous God, which is why in the Old Testament he keeps sticking his nose in and shouting at everyone. The title “Jealous/Zealous” is also appropriate for a god represented by a volcano, as was Yahweh by the smoky and fiery Mt. Sinai. Hence, Yahweh’s followers themselves were intolerant and hotheaded zealots. art, writings and traditions of these various ancient cultures, including Sumero-Babylon, India, Egypt, Chaldea, Phoenicia, Canaan, etc., show an advanced degree of civilization surpassing that which followed it. Such later degradation is particularly true when it comes to biblical peoples. The Bible, in fact, represents a dumbed-down version of the mythology of the aforementioned cultures. In reality, in terms of cosmic knowledge, in many important ways modern man has devolved. One of the major problems is the compulsive and irrational historicization and vulgarization of the planetary bodies and of the celestial mythos and ritual, a body of knowledge and wisdom concerning the cosmos and specifically the solar system, which filled the ancients with awe and reverence. This mythos and ritual is found worldwide, reflecting a global culture in ancient times. This body of knowledge is discovered in stone and story all over the world, reflected in the mysterious megalithic ruins.